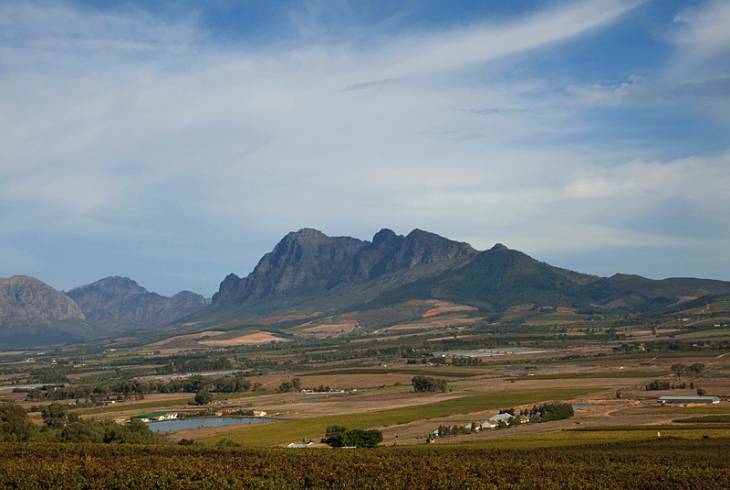 The Western Cape wine lands town of Paarl is situated between the Paarl Mountain Nature Reserve and the grand Du Toit's Kloof mountains. In the Nature Reserve you can see enormous granite domes, among them the second largest granite rock in the world, towering above the town and looking like giant pearls as they glisten with moisture in the morning sun. Paarl is often referred to as the pearl of the Berg River Valley. The mountain was first named the Peerleberg or pearly mountain by a pioneer explorer in the 17th century. The town was established in 1720 with the building of the first church there. Paarl Mountain (called Tortoise Mountain by the Khoikhoi) was declared a National Monument in 1963, one of the first mountains to have so been. The Paarl Museum houses a fine collection of Cape antiques that include silver, brass, porcelain and brass as well as a collection of stinkwood and yellowwood furniture. Bethel Building, the oldest surviving building in Paarl, dates back to 1710. Paarl is an excellent place to be centred for touring the Western Cape. There is ample accommodation here and simply dozens of attractions and activities to keep the visitor occupied. Paarl overview. Paarl Accommodation and Information.